Spanish tapas? Count us in! 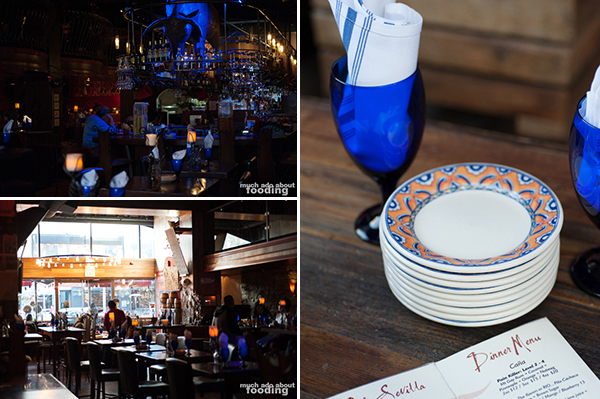 Cafe Sevilla had us intrigued upon looking at their menu. Now, we do not often find ourselves out in the streets of Long Beach but as the area keeps developing and restaurants keep getting more accolades, we have had more reason to venture in that direction. This year's restaurant week looks promising. Taking place February 28th-March 5th, it will certainly attract many to restaurants in the likes of Cafe Sevilla. 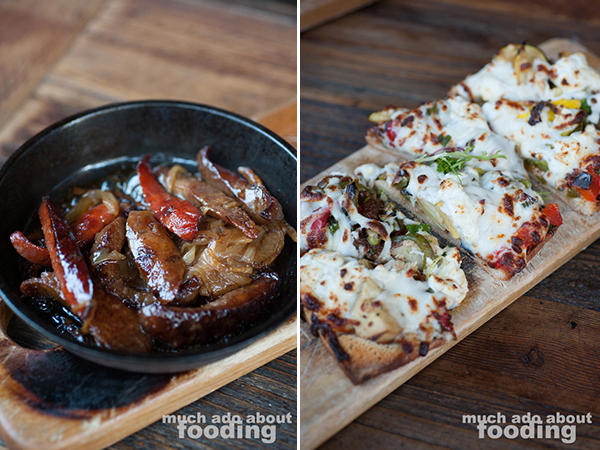 We were invited out to give the tapas-oriented eatery a try, and we came away from the experience realizing just how much of a deal diners will have when they drop by this tasty place during Dine Out Long Beach. Plenty of food and plenty of flavor are on the line! Cafe Sevilla is located on the easily accessible and highly visible Pine Ave in downtown Long Beach and is separated into two sections featuring the regular restaurant and what appeared to b a club. The outdoor patio was very welcoming and was where we ended up; however, the inside was quite charming as well. It certainly presented with a Spanish vibe - intimate but bold. 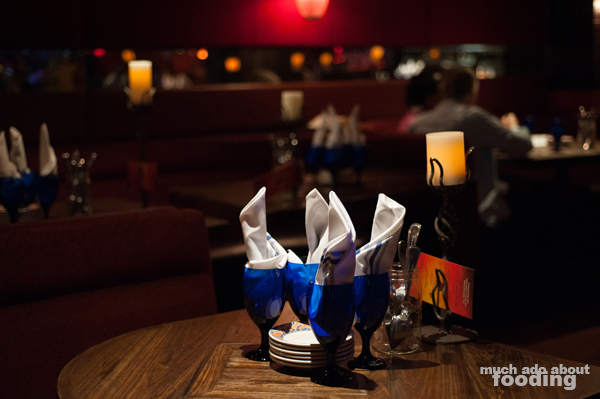 Deep blues and reds ran rampant throughout, and the buzz of conversation was constant. Ah, the environment that tapas fosters! To get a best sense of what a Dine Out Long Beach diner would experience, we opted to try menu items that would be on the list of choices during that week. From their Crudos / Ceviches were two options on the Dine Out menu: Shrimp & Red Snapper ($10) and Salmon ($11 - blood orange sangria and jalapeno). We went for the salmon since that's Duc's preferred raw fish, and it ended up being a good choice. The blood orange sangria that was incorporated brought out some interesting flavors to the overall dish because it presented somewhere between sweet and tart. Admittedly, the portion was a bit underwhelming but tapas are meant to be smaller plates to share. We liked the slight kick from the jalapeno and definitely the sliced and grilled baguettes to top. 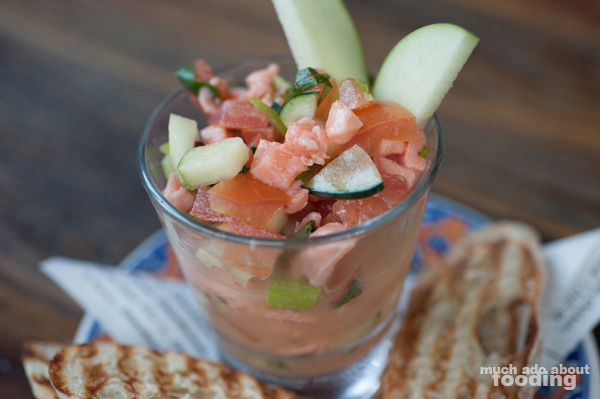 The salmon was tender and fresh though I would've preferred more uniform cuts for even ceviche distribution. Several options on their Tapas de Carne section are on the Dine Out Long Beach menu - Chuleta de Cerdo ($18 - pork chop stuffed with chorizo in a sherry and cider glaze), Rioja Short Ribs ($14 - Rioja red wine), and Grilled Spanish Salchicas ($12 - Spanish sausages and brandy flambe). For some flair, we went with the salchicas and what a little show that was. 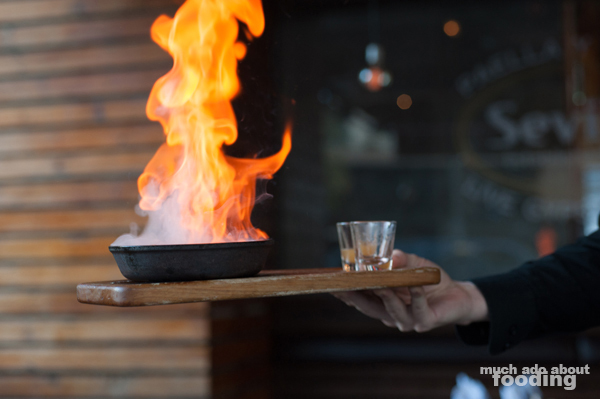 Our waiter brought out a board and quickly lit our food on fire for the flambe. The mouthwatering smell of Spanish sausages filled the air shortly after, and he set down a skillet of savory meats that we swiftly devoured. Paired with caramelized onions, these were a great way to get one's fill of hearty Spanish meats. To offset what could have been too heavy a plate, we also indulged in some creamy Garlic Manchego Mashed Potatoes ($6). From their Cocas (Spanish flatbread) section, the Grilled Vegetable ($11 - asparagus and goat cheese) is on the Dine Out Long Beach menu so naturally, we decided to order that. Generously covered in melted goat cheese and scattered grilled vegetables, each delicious slice really hit the spot. The bread had a pleasantly crunchy bottom, and the toppings were well balanced. Then it was time to shoot for a traditional dish - paella. 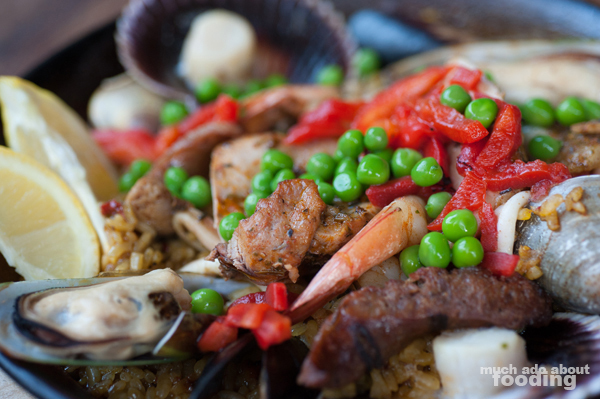 Cafe Sevilla has more than six varieties on their Paella menu but the one in particular we wanted to explore was their Traditional Paella Valencia ($27/$52 - mussels, clams, calamari, shrimp, scallops, chicken, and grilled sausages). Loaded with a healthy amount of seafood, this paella was by no means scanty. The shellfish were cooked well as was the shrimp but we felt that the calamari and chicken may have been a touch overdone. Squeezing a little bit of lemon certainly helped mellow out the rice that came out slightly saltier than preferred. Overall, the portion was the right size to share between two people. 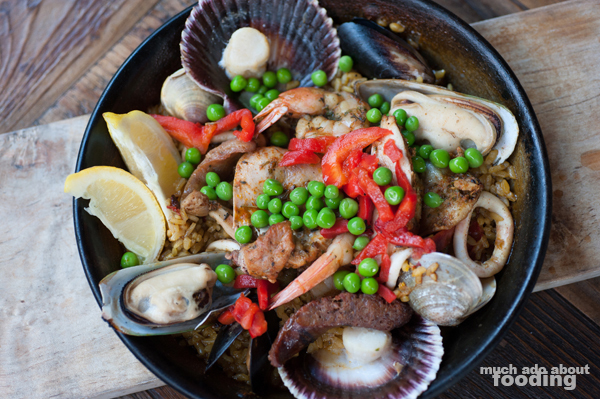 Coming in at $27 regularly, this paella is easily a steal for the restaurant week where three courses only cost you $30! Other sections of the regular menu that have Dine Out Long Beach items include Tapas Clasicas for the Tortilla Espanola ($8 - "potato tart" with roasted tomatoes, garlic, and goat cheese), Patatas Bravas ($7 - tomato and pimenton), Datiles Rellenos ($8 - Medjool dates, Cabrales Bleu cheese, and applewood bacon), and Albondigas al Jerez ($9 - Spanish meatballs with sherry and garlic) as well as the Tapas del Mar for Pan Seared Salmon ($18 - with chimichurri) and Brochetas for the Pollo ($18 - chicken, shallots, and herbs). To end, dessert was necessary. 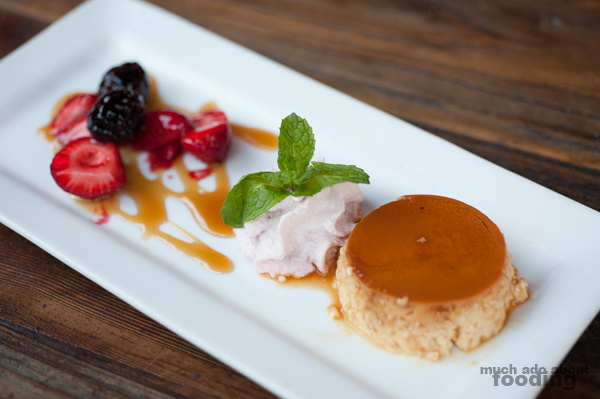 Two desserts on the regular menu are featured on the Dine Out Long Beach menu - their Orange Scented Flan ($7 - citrus marmalade and Spanish chantilly) and Andalusian Apple Tart ($8 - rum-infused raisins, Granny Smith apples, and brandy anglaise). We weren't feeling like raisins so ran ahead with the flan which came out with some berries alongside. This particular flan we got was not very smooth and tasted more of egg than we were accustomed to in a flan. The "orange" was not as pronounced as we had hoped either. I can only wonder how the tart would have been but perhaps they are not as focused on desserts here seeing as their tapas selection is vast.